Have you stood before a thing so small, so inconsequential, so everyday as to be un-noticed, and grasped all at once that you were staring at the most important thing in the world? The miniature kitchen play area filled me with memories. And the building blocks. And the neat stack of sleeping mats for nap time. The smell of crayons and bread crusts. In a preschool class everything is scaled to a size for three and four year-olds. Standing there as the visitor, I felt (quite unusually for me) tall. I quickly was more in place to be down on a blue child-sized chair with the children. One of several guest artists in a program coordinated by our local museum, last week I completed my schedule of visits to HeadStart classes. 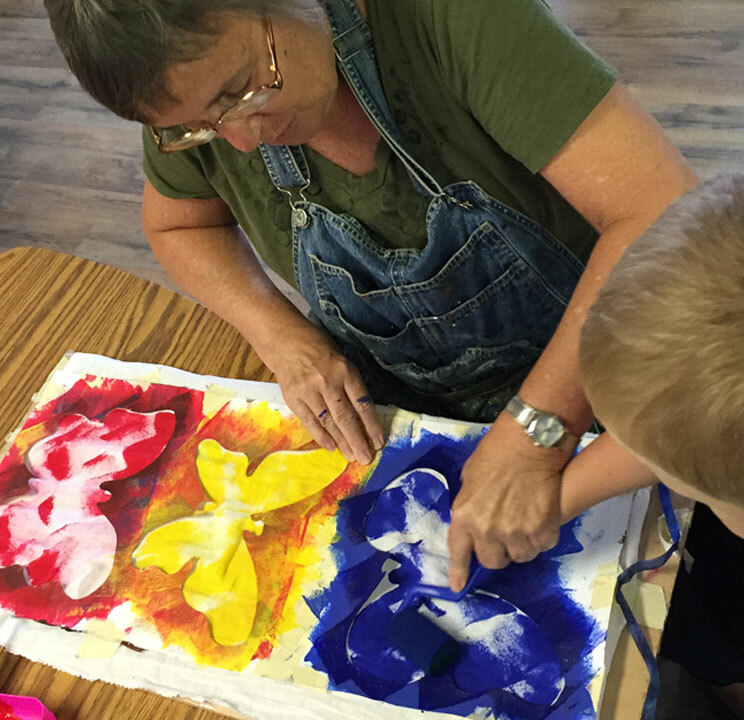 While I was there I shared a piece of my own artwork for children to see and touch, and I led a little hands-on exercise of stencil painting butterflies on a cloth banner for the children to display in their classroom. As I sat on my child-size chair, down at their level, holding little hand after little hand to guide the paint roller, I could not think of anything going on in the whole world at that moment more important than the experiences those children were having in class that day. I began by asking each child what color they wanted to paint. “Red, or yellow, or blue?” It’s a big decision. They made their decisions seriously. Each day, these little minds are absorbing, processing, understanding, gaining skills, negotiating the world around them. Loving and educating children is the single most important thing we grownups do to determine how tomorrow will turn out. To the teachers who are there every day – singing “The wheels on the bus,” teaching colors, reading stories, holding during sad times, correcting and leading… I wish to shout “THANK YOU” from the rooftops. As one very very small part of the process —just a guest visit — I could not have been more honored. Sweet little children held out their hand to grasp mine and a paint roller for a few short minutes. That’s as good – and as important – as anything can be. (Left) Our butterfly banner - created by the children in the classroom with foam rollers, tempera paint and cotton kitchen towel. (Right) I discovered the importance of being organized. These plastic boxes served as roller trays for the paint and were easily packed up to take to the next class. Well worth the $1 each they cost!